When tackling the immense project that is a work of narrative fiction, many writers begin by dividing up the events that occur in their story into separate general areas commonly referred to as Acts. Whether done instinctively or because of something once read, most agree that this practice is both universal and helpful. But what is left out of many of the discussions concerning Acts is why they even exist in the first place. Is it really simply a way of dividing a story up into Beginning, Middle and End as Aristotle believed thousands of years ago? Or could there possibly be a more meaningful reason why stories naturally move through four distinct areas? If one accepts the idea that stories are about solving problems, then the reason for Act divisions becomes clear. The Inciting Incident occurs, introducing a problem into the lives of the characters who inhabit a story. In order to resolve it, a certain approach is taken—some characters work for the eventual resolution of the problem, others are firmly against such an endeavor. The two forces battle it out until all the dramatic conflicts within that one particular approach are exhausted. If the problem continues to exist, a new approach must be taken, and thus, a brand new Act is required. This is why Acts exist within a story. They signify the change in dramatic focus the characters take in order to solve the problems within a story. The reason there are only four acts in every complete story is because for every problem we can experience in our lives, there are four major contexts, or dramatic approaches, we can take in order to go about effective problem-solving. Let’s say, for example, that we are writing a story about a group of boxers and the challenges they face rising up through the amateur circuit. Their struggles come because they simply aren’t very skilled boxers. Sure, they might have mental blocks or doubts about their abilities, but the true focus of this particular story is their prowess within the ring. We want to write a complete story, and thus want to make sure that we cover all four contexts from which to examine this particular problem. When it comes to physical activities like this, the four basic contexts are DOING, OBTAINING, UNDERSTANDING and LEARNING. Once our boxers have moved through these four areas they will have explored every aspect of boxing from a physical standpoint and will have either found a way to solve their problem, or not. The first, and probably most easy context to “get” is the context of actually DOING something. In this act, our group of boxers would explore the difficulties and conflicts created by body blows and uppercuts. The older more experienced boxers would challenge the younger ones and individual skill levels would be brought to test. There would be a lot of pain in this Act. The second context would concern itself with OBTAINING something. Here, the group of boxers would perhaps duke it out to see who will end up on the final team and who will go home with their tail tucked between their legs. There could be lives taken in this Act, if not arms broken, and falls taken for money. Anything and everything to do with achieving or losing something would fall into this category. The third context deviates from the first two in that, at first glance, it seems to delve into more of a mental context. However, this is not so, as the struggle towards UNDERSTANDING something is truly a physical problem. In this act, the boxers would battle against their previous training, perhaps fighting their instincts to cover-up when their trainer wants them to open up instead. There would be accusations of cheating and confusion over one boxer’s proclivity to feint at the sight of blood. See how our story is suddenly beginning to feel more full? Proponents of a three Act story structure would tell you that that is it, you’ve covered the three basic movements—Beginning, Middle and End—and now it’s time to wrap things up. But you know that feeling you’re experiencing right now? That feeling that something is missing, or has yet to be covered? That is the same feeling an audience experiences when a writer has failed to cover all four contexts. This is a feeling that should be avoided at all costs. The fourth and final context of solving the physical problem of boxing comes with LEARNING something. Initially, it may be difficult to see the difference between this and the previous context, but if you think of Learning as the actual collecting of information and Understanding the act of making sense of it all, the differences should become apparent. In this fourth Act, the boxers would learn new techniques, analyze film footage of previous bouts, and argue over what the line-up might be for the next tournament. They might discover one of them needs special treatment and spend late nights in the ring helping him out. They might even spy on the other group of amateurs across town. Anything to do with the struggles involved in the gathering of information would find a home in this Act. And with that, the story would now be complete. There would be no need to go back and show more scenes of fighting, or have yet another scene of someone losing their house because of their dedication to the sport. Those struggles, those contexts, have already been explored and movement has been made forward towards the ultimate resolution of the initial problem created by the Inciting Incident. To go back would be redundant, and completely unnecessary. As with the previous example regarding the group of boxers and the amateur circuit, the following film examples will focus primarily on the problems experienced by everyone in the story. Complete stories, especially films as wonderful as those below, are complex thematic explorations of different problems seen from many different points-of-view. In order to keep this article as focused and as simple as it can be, much of the more personal and heartfelt moments of each individual story will be left for another time. For now, we will hone in on the major problems that affect every character in the story. The major problem of Star Wars revolves around an Empire that has grown ruthless in its efforts to contain any rebellion. This problem begins with Darth Vader’s attack on Princess Leia’s ship and continues until the eventual destruction of the Death Star. The First Act explores the fallout from Vader’s attack and the Rebel’s new Understanding of what it is they are dealing with now. The Act culminates with the Empire’s attack on the Jawas and Luke’s Aunt and Uncle. The Second Act finds the Rebels Learning the true destructive power of the Empire when the evil baddies test their weapon out on Alderaan. The Third Act has Luke and Co. Doing what they can to fight the Empire as it hunts down the hidden Rebel Base. And finally, the Fourth Act finds both good guys and bad guys fighting it out over who can destroy the other one first. With this last Act, the story can end. Every context from which to examine an out-of-control governing body has been explored. They first tried to understand, then they were forced to learn, followed by actually doing something about it, and finally ending with winning and losing. Any further understanding or fighting would have required an entirely new story. Jumping from the Understanding to the Doing would have left the story feeling empty and hollow. Four acts, four contexts from which to examine a problem. The major problem of Unforgiven surrounds a group of no-good assassins and their attempts to collect reward money for what many deem a reprehensible act. The problem begins with the Sheriff’s less-than-equitable punishment for the abuse of an innocent woman and ends with William Munny exacting revenge for those who decided to decorate their saloon with his friend. The First Act finds the whores Understanding Little Bill’s warped sense of justice and their solution of offering up a reward for revenge. The Second Act turns with the arrival of English Bob and forces the Sheriff into teaching everyone what happens to killers and villains who come to Big Whiskey in search of the whore’s gold (Learning). The Third Act has William Munny and friends hunting down those responsible and Doing what they have to in order to collect the reward, especially when others can’t. And finally, the Fourth Act forces Munny into exacting revenge upon his friend’s killers, killing whoever stands in his way (Obtaining). Once again, we have that feeling of completeness that comes from fully exploring every way to solve the problem at hand. 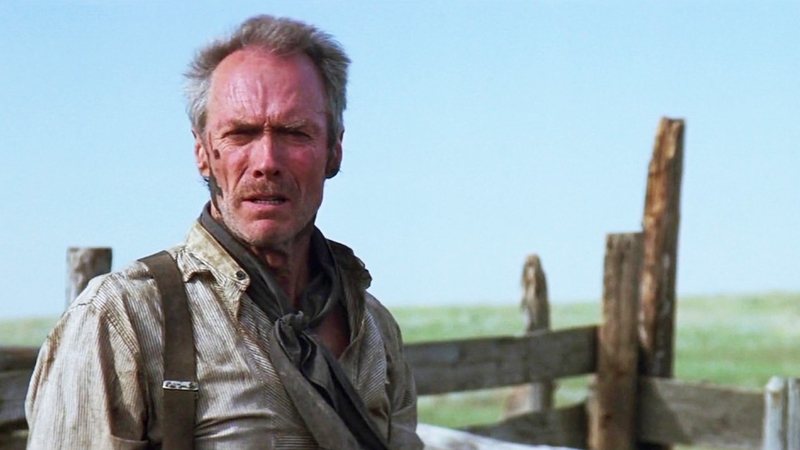 If for some reason David Webb Peoples (the screenwriter of Unforgiven) had left out the conflict that comes when Ned can’t Do what they came to do, the film would have felt less complete. It would have been similar to those times when someone leaves out a key portion of their argument, if only because it bolsters their position. The audience knows when a story “skips” over a key context in solving a problem. Exploring all four insures that the audience will leave satisfied. Note that the Act order of this Academy-Award winning Western is exactly the same as that of the popcorn science-fiction classic, Star Wars. It starts with an Understanding that moves into Learning, then turns to Doing which eventually slides into Obtaining. Yet, is there anyone out there who would contend that these two films are the same? Story structure doesn’t and shouldn’t dictate what kinds of scenes should show up in a story. It shouldn’t require a “Call to Adventure” or a “Dark Night of the Soul” or any other simplistic interpretation of story structure that has no real meaning or hampers writers with the same kinds of scenes over and over again. It should, however, provide the necessary order of events needed to produce the kind of meaning an Author hopes to instill in the audience, leaving them plenty of room to write whatever their heart tells them. That is what happens when Acts are seen as progressive contexts for examining a problem. This is the way complete stories are written. Both Star Wars and Unforgiven called for this plot progression of Acts because of the story they were trying to tell. Different stories call for different plot development depending upon the Author’s choice of certain structural and dynamic choices. In next week’s article we will cover other films that, although they explore the same four contexts of Understanding, Doing, Learning, and Obtaining, do so in a different order, thus producing a completely different kind of meaning. Dramatica refers to these different contexts as Signposts. While the above explanation focused its attention on the Objective Story Throughline (the throughline that considers everyone in the story, regardless of personal issues), there are other Signposts for each of the remaining three Throughlines (Main Character, Impact Character, and Relationship Story Throughline). In this way, the problem that sits at the center of the story can be explored from every single perspective. This is what gives a story meaning. Star Wars and Unforgiven have Objective Stories that reside in the Physics Domain, thus the reason why the four Signposts are Understanding, Doing, Learning, and Obtaining. These are the four contexts from which problematic activities can be explored. The other Throughlines would have completely different contexts depending on where they resided within the structural chart.